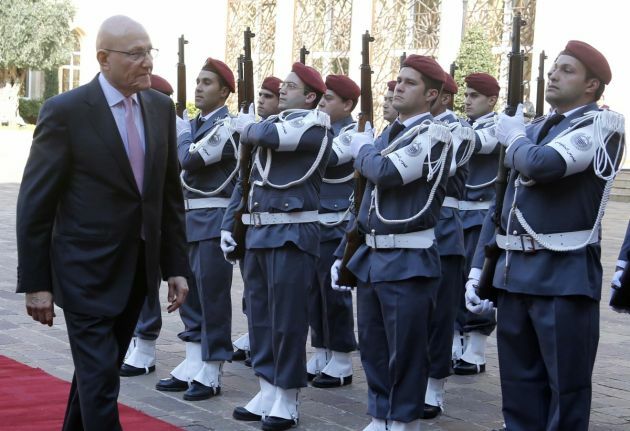 (Photo: REUTERS / Mohamed Azakir)Lebanon's Prime Minister Tammam Salam reviews an honor guard during an official ceremony at the governmental palace to mark his assumption of duties as the new premier February 17, 2014. Lebanon announced a new government on Saturday, breaking a 10-month political deadlock during which spillover violence from neighboring Syria worsened internal instability. BIKFAYA, Lebanon (Reuters) - A week ago, Lebanon was without a government and facing the prospect of an even deeper crisis come May, when President Michel Suleiman's term was set to expire with no agreement on his replacement. But in a matter of days, a degree of hope has returned to the politics of a country plunged into crisis by the war in neighboring Syria. Lebanon has a government after nearly a year without one, fueling hope that a new president will follow. Prime Minister Tammam Salam finally managed to pull his government together after 11 months on Saturday, grouping politicians from across a political spectrum divided by the Syria war and other conflicts that predate it. Lebanon's parliament must now elect a new president by the end of May. The vote requires a two-thirds quorum. But parliament has also fallen victim to the political crisis. It has not convened since last May, when it extended its term after a failure to agree on a new election law. Gemayel said Iran appeared set on improving relations with Saudi Arabia, which in turn might be ready to normalise ties with Tehran pending resolution of their regional disputes.